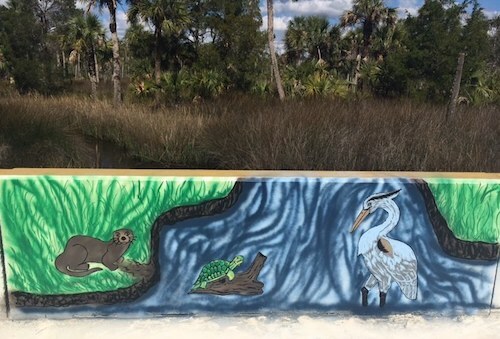 Travelers on the Dixie Mainline, one of the favorite trails on the Lower Suwannee National Wildlife Refuge, can now enjoy new bridge murals by Old Town resident Clint Wynns. Wynns, a 66-year-old former professional chainsaw carver always wanted to paint murals to enhance the Mainline bridges. He hunts in the Refuge every day from archery through regular gun season and is always looking for ways to help out on the land he knows so well. Yet he hesitated because he thought a mural would attract graffiti and didn’t want to waste his time. 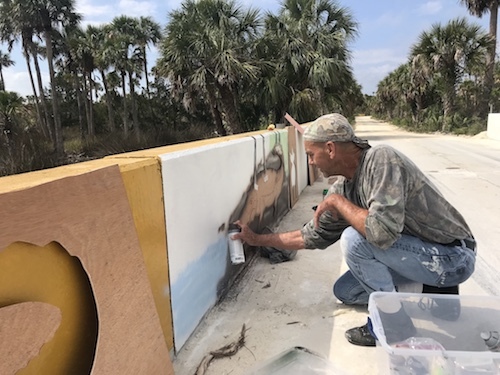 When Debbie Meeks decorated one of the bridges with an alligator painting last year—and it went unmolested—he decided to try. He cuts templates out of thin luan plywood. This technique shortens the amount of time he spends on the bridge. First he tapes up the inner shape and paints the background. Then he reverses the template by taking down the inner shape and protecting his painted background with the surrounding plywood sheet while painting the animal. Once the whole painting is dry he ties both pieces of the template together which allows him to spray paint the cut line for a dark outline without hand tracing. "So many people have stopped while I was working—all classes of people—to tell me how much they appreciate what I’m doing. Kids get out to look and I show them how they can help.” Clint says. More murals are needed. You can adopt a bridge by calling Larry Woodward, Deputy Refuge Manager, at 352-493-0238.